America's Presidents showcases the nation's largest collection of portraits of all the presidents beyond the White House's own, capturing the permanent exhibition that lies at the heart of the Portrait Gallery's mission to tell the American story through the individuals who have shaped it. 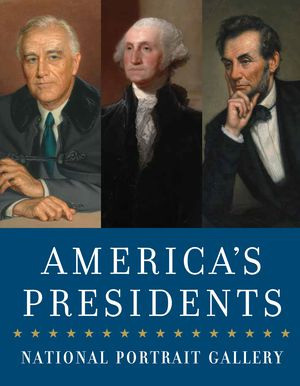 The book explores presidential imagery through portraits ranging from the traditional, such as the iconic and newly restored "Lansdowne" portrait of George Washington by Gilbert Stuart, to the contemporary, such as Elaine de Kooning's colorful depiction of John F. Kennedy. Many of the featured portraits reveal much about the sitter, such as the intimate rendering of an informal George W. Bush by Robert Anderson and the fanciful, mosaic-like Chuck Close image of Bill Clinton. Some tell us more about the artist, such as the likeness of Franklin Delano Roosevelt that Douglas Chandor planned to include in a larger work about peace that would commemorate Roosevelt's Yalta meeting with wartime Allied leaders Winston Churchill and Joseph Stalin. Works in other media, including sculptures and daguerreotypes, round out the presidential collection. Lively narratives accompany each piece, exploring the president's background and biography as well as the work's artistic and historical significance. Taken together, the portraits are a powerful visual exploration of the history of the highest office in the land and the diverse men who have held it.